Secure transport - no one can eavesdrop on the message content during any stage of transport or delivery. Secure storage - messages (sent via PGP, S/MIME, or Escrow) are stored while encrypted on disk so that they are secure in backups and protected against administrative disk access. Access by any recipient with a valid email address - no matter what email service provider they have or email software they use. Only the intended recipients of your messages are given access. Guaranteed integrity of message content. Optionally restrict all server-side email forwarding rules from your account to external addresses to be only to recipients whose email servers support SMTP TLS for email delivery. Your username and password remain secure when logging into our services. Send secure messages using LuxSci WebMail, LuxSci SMTP, or Mobile Sync. Decrypt PKI-secured messages in WebMail or upon delivery. Send one message to multiple recipients who require any combination of different encryption mechanisms. 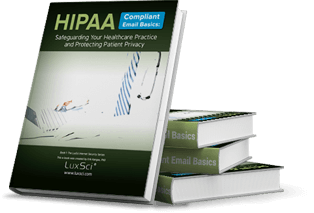 Continue using LuxSci's email archival services, outbound email content monitoring services, and global message tag line service. Forward and reply-to secure messages. Define recipient domains that will be exempt from encryption. Opportunistic TLS for delivery of all messages to all recipients. Optional Forced SMTP TLS-Only delivery of messages to recipients that support TLS. Enhance Security: Disable Forced TLS on a per-message basis. If Forced TLS is enabled as an option, you can disable it on a per-message basis with one click (in WebMail) or by adding custom text to your message subject (when sending from your email program or device). In these cases, Opportunistic TLS will be used in combination with something more secure than TLS: Escrow, PGP, and/or S/MIME. Three Modes: Encryption Always On, Optional and On by default, or Optional and Off by default. You can configure how SecureLineTM is used on a global, per-domain, or per-user basis. This includes having all messages encrypted, or only some with encryption enabled or disabled by default for all new messages. If you choose to have Encryption optional but enabled by default, then all messages sent without SecureLineTM are logged for auditing reasons, and copies of them can be sent to an auditor email address for review. Integration into Microsoft Windows Outlook v2007+ via the free SecureLineTM Plugin.